lightly sweetened grass-fed milk and cream and a swirl of buttercream"
Weird, my other pint had a seal, but no matter... cause I'm hungry and it looks awesome. 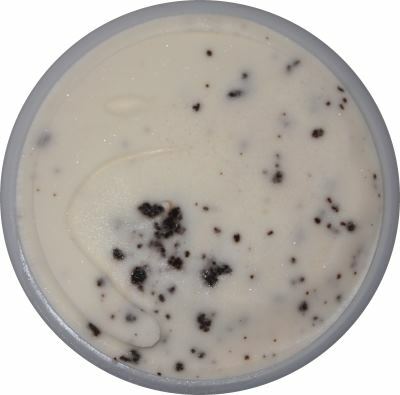 You know me and Nick have a thing for Cookies & Cream flavors and the visuals here are reminiscent of that. So Excited! Whoa Whoa Whoa Whoa.... is that a cinnamon burn I just got from my first bite? What the scoop? Nope, checking ingredients, no cinnamon, but their is a bourbon vanilla extract. Whoa, was not expecting that. First there was a wave of intense sweetness but then it totally gave way to a burn. Is that even a thing? Hold on, bourbon vanilla means location, not alcohol. I must be going nuts. Let's try this again. Ok, you don't notice the burn if you keep scooping, but when you stop, it lingers in the background, but that may have been from my first few scoops. 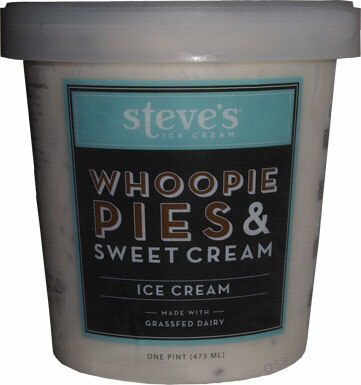 Yeah, you all think I'm crazy right now and that's fine, I'm use to it.... ahhhh, it's the whoopie pie pieces. Oh, that's just wrong. Sorry, but I'm stopping this for now. I do not need this so close to bedtime. On Second Scoop: Great, just great. I was all ready to tell you guys how I was crazy but as I was finishing up the third scooping, I hit this huge whoopie pie chunk and then the burn came back! What is up with this flavor? You don't notice it in the little bits, but with the giant chunks, there is just something not right here. At least not to me. I don't think whoopie pies should taste like that. Uggg, now I have to take back all the nice things I was about to say back. I was going to say it's a quality, all natural product. I then I was going to comment on how very dense it is and how I think that density holds the flavor back. Even if you let it sit out for 10+ minutes (which I hate doing), there's still a simplicity to the base. It's very milky or maybe saying it's basically the flavor of whip cream, but like store bought whip cream that doesn't have a ton of flavor. And then I was going to wrap up by saying that I just expected to be wowwed, that's all. I want a whoopie pie and sweet cream battle to commence on my taste buds, I want them to each fight for supremacy, I want them to live up to the visuals! I want them to not burn! But now I just have to say, what is up with this pint? If you've had this, what was your experience like? Verdict? where is that burn coming from? 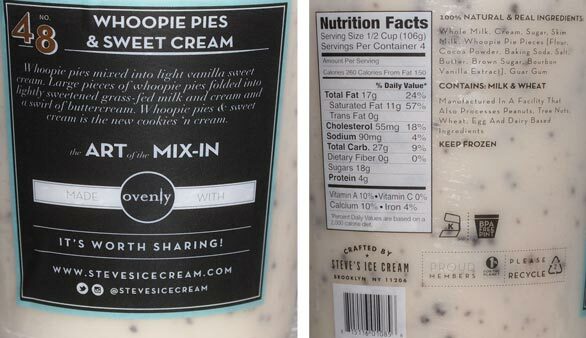 Yeah, a whoopee pie and sweet cream ice cream sounds like an awesome flavor combination that I want on my taste buds, too! Sure it's not bourbon, comma, and *then* vanilla extract? It was on a separate line. I say this because they have a bourbon vanilla flavor, and bourbon is listed as a separate ingredient. Just got this pint last week. It did nothing for me. 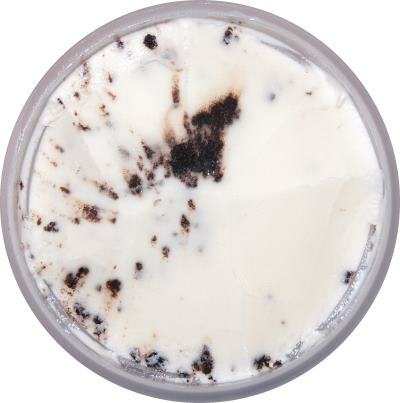 It felt more like a oreo ice cream than woopie pie ice cream to me and even if I considered it an oreo ice cream it would have ranked low on teh scale. Half of my pint had nothing but plain vanilla in it. Not even a hint of woopie or anything. @Latchkey: good question since that would explain it, but they have commas on the other lines when it's two separate ingredients. @TheIcon: yeah, someone on instagram said the same thing. For me, the little pieces don't add much but then I got the burn from the huge chunks. I couldn't win! Personally I tasted black pepper. The sweet cream ice cream was bland. The whoopie pie pieces were inadequate in both quality and quantity. I was extremely disappointed by this flavor. @Charlotte: that's just nasty :) There's gotta be some funky secret ingredient in there or something else amiss.